← Connie K. Taylor, M.Ed. 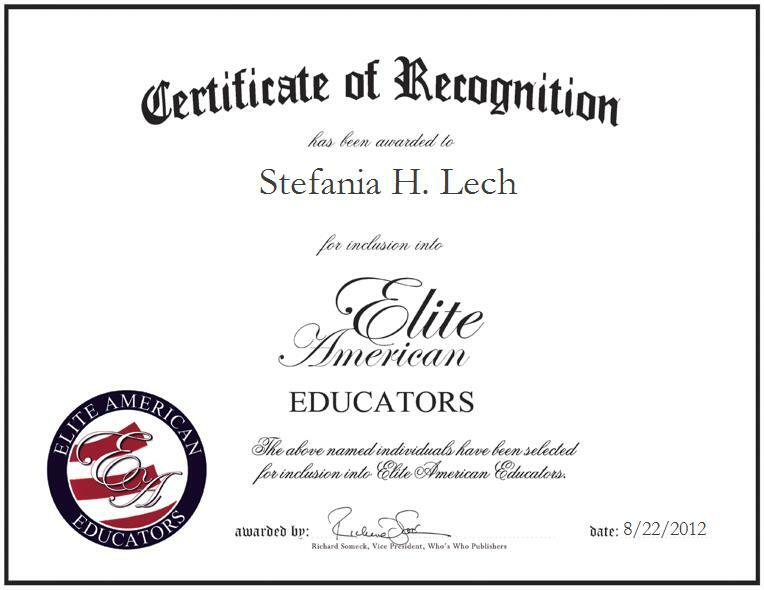 SOUTHAMPTON, MA, August 22, 2012, Stefania H. Lech, Art Teacher at The Peck School of Holyoke Public Schools, has been recognized by Elite American Educators for dedication, achievements, and leadership in art education. A diverse and varied background in fine arts allows Ms. Lech to teach others to bring out their best artistic and creative traits while learning. She specializes in painting, color theory, printmaking, and stained glass, and she also possesses proficiencies in ceramics and the history of art. Ms. Lech is primarily responsible for managing art education for sixth, seventh and eighth grade students, and she teaches ceramics, design, history, abstract and realistic painting, and oversees student exhibitions. Ms. Lech has been a teacher ever since she graduated from Rhode Island School of Design in 1974, and has always found teaching to be a noble and highly rewarding profession in many aspects. She was always heavily involved with the children’s lives, especially in the lower grades, when the teacher is like an extension of the family. The best part of her current role is that she teaches a “fun” subject called art, where the students have an opportunity to express themselves and are often disappointed when she announces it is time to clean up and that class is over. One of her students wrote a glowing article about her attributes as a teacher during Women’s History Month. Beloved by her students and peers as a passionate and doting teacher, Ms. Lech has garnered a reputation of distinction for her outstanding efforts. She is a two-time recipient of the title of Distinguished Educator, as granted by Who’s Who Among American Teachers in both 2005 and 2006. The highlight of her career was exhibiting her own work at local art museums and art galleries. In addition, she participates in yearly art exhibits with other art teachers from the Holyoke District.